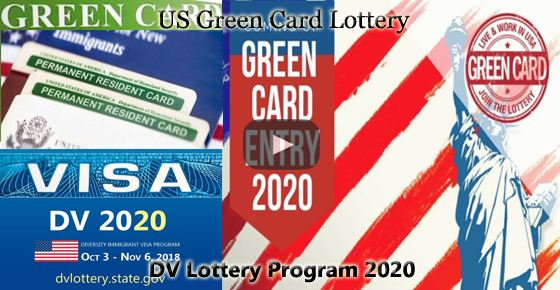 Diversity Immigrant Visa (DV Program), also known as the Green Card Lottery, is a US government lottery program designed to receive a US Permanent Resident Card. Under the DV program, 55,000 immigrant visas would be available in an annual lottery began in the year 1995. It provides for 50,000 immigrant visas per year and aims to diversify the immigrant population in the United States by selecting candidates from countries where the number of immigrants is low in the previous five years. Online registration for the DV-2020 program will be completed on Tuesday, November 6, 2018 at 12:00 noon (EST). Follow the official DV program website below for step-by-step instructions and submit the entry. The current review process is being conducted by the Kentucky Consular Center (KCC).